Well, it’s been a year since I was finally able to get my grubby meerkat paws upon the Nintendo Switch (thank you Mum!). It’s therefore also been a year since I got my mitts on The Legend of Zelda: Breath of the Wild. One year on, how do I feel about the Switch, Breath of the Wild and for that matter, Super Mario Odyssey? Breath of the Wild was the catalyst for desiring Nintendo’s latest hardware. If the Switch were not on the horizon, I might have instead gone for the Wii U, which also received the latest Zelda title. Given the nature of the Switch and the promise it held, it became inevitable that it would be what I’d go for, whilst Breath of the Wild was a certainty either way. The Switch itself has proven to be a sturdy and entertaining console, with the unique ability to treat it as a hand-held providing versatility. To switch (heh) from TV mode to hand-held mode it is a pretty seamless exercise and the console’s performance is pretty good in either state. An X-Box or PlayStation it’s not, but it’s not aiming to be a powerhouse. With Breath of the Wild, a long-awaited new chapter in the Zelda franchise began. Originally the game was planned for release in 2015 as a Wii U title, however the game was delayed a couple of times whilst Nintendo ironed out a few kinks. By the time they’d perfected the title, the Wii U was clearly waning and the Switch was on its way, however Nintendo had promised Wii U owners a new Zelda game, so Breath of the Wild proved the final Nintendo game for the Wii U, as well as a Switch launch title. Prior to Breath of the Wild, my previous experience of Zelda had been the 2011 title Skyward Sword for the Wii, a game that had left me with mixed feelings. Nintendo had promised something very different for their new game. The trailers, chat and tidbits all leaned that way, but would it prove true? As I started up my adventure, I was nervous and excited. There had been so much hype, so much talk of the potential and nature of this new game. A glorious open world had been promised – and it would prove true. The Zelda franchise had drawn inspiration from its origins, returning to its roots to deliver a wonderful experience. My adventure, my journey, was truly mine. My path across Hyrule was unique to me. My solutions to problems were unique to me. On the course of my travels, I would discover so many wonderful and challenging moments and quests. Take, for example, the above scene. From memory, I’d glanced at the map, spotted a weird arrangement of shapes and made my way to it. The shapes were in fact statues; each had a specific orb that had to be placed into a certain pedestal. It wasn’t signposted, it was simply sitting there, waiting to be noticed. This structure was a huge maze – one of three in fact – that again, I more or less stumbled upon. I had been looking for something else when I wound up at this labyrinth, but as I was there I decided to check it out. This haunting scene (spot the active Guardian among the dead ones) first greeted me as I made my way to Hateno village (the first village I travelled to). Here was the site of a huge battle – you just knew something very serious had gone down here. Breath of the Wild has proven very good at tying into previous games in the series. The screenshot above is one such moment. I’m not telling you what game – you’ll have to guess! The Lost Woods often tend to be quite eerie and this is one of the best executions of this idea yet. The atmosphere is incredible. This was easily one of the best parts of my adventure. The Forgotten Temple – and it’s filled with Guardians. Once again, this was more or less a case of ‘what’s that on the map?’ Timing was quite crucial here! Th Master Sword. The Deku Tree. Need I say more? There’s a lot more. 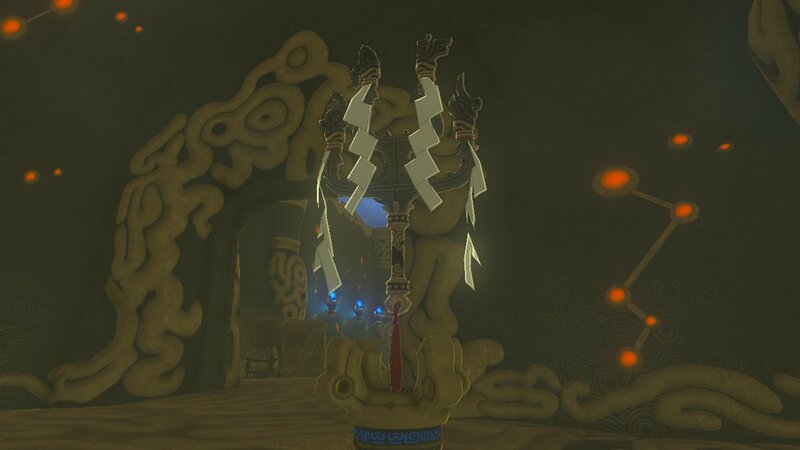 Above, I had finally completed the final part of the robust Trial of the Sword, part of Breath of the Wild’s download content. The trial was made to test the player and it certainly succeeded! Another element to the download content was the Ballad of the Champions. This added several new, very difficult Shrines and filled out a bit more of the story. Even as I look over the past year of amazing adventure, it’s inevitable for thoughts to drift of what’s going to happen next. Breath of the Wild won Game of the Year, deservedly so, which raised the question of how Nintendo can possibly improve upon it. On top of that, what else is coming for the Switch? Super Mario Odyssey proved to be a really good, fun game, but Nintendo need to follow this up strongly. A mainstream Pokemon RPG is on the way, hopefully Super Mario Maker will appear at some point, so the future can be bright. I certainly hope it is.